Till now we learn how to display various Yammer feeds with the help of various options. Those options are helping you to display the feeds on the page of a particular objects. But in enterprises its all about getting data quickly. SharePoint has its own search service which returns information which is searched. Similar to that Yammer also has its own search functionality. But this is present on the yammer website. Once you integrate Yammer with SharePoint you will look for yammer information also with search results of SharePoint. 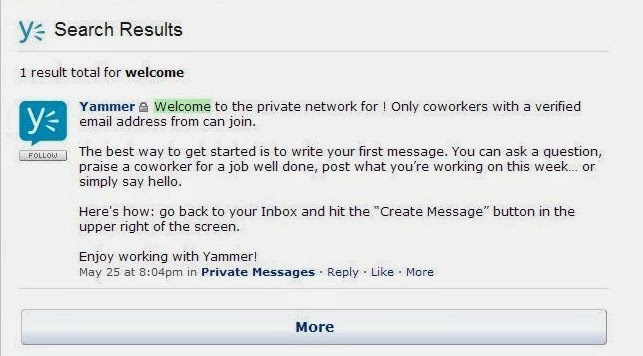 For this you can prefer Yammer web part. Put this web part on the search results page and configure it with search and see results from Yammer. It is simplest way to integrate Yammer search with SharePoint search results. Following are the steps to configure web part. 3. Click on the Search feed. 4. Select the proper network and enter the query string parameter. 7. Save and close the page. Now whenever end user search anything and search result page gets rendered Yammer web part will also display search results from the yammer. In this way we have seen how to integrate yammer with SharePoint using Yammer App web part over series of articles.